Okay, so you all love the booze and are concerned about boozing in Bangkok, my most popular post is this one regarding mid-afternoon prohibition and the majority of emails I receive have questions about when and where people can get their drink on. 2015: There was a load of big announcements and PR about the ‘new rules’, it seems there is only once change to the current rules/selling time and that involves the purchase of larger quantities of alcohol. Prior to 2015, you could purchase alcohol in larger quantities anytime during the day (makes no sense, right? ), this has now changed and alcohol is only for sale from 1100-1400 and 1700-2400. As always, you can usually buy alcohol at any time from a ‘mom and pop’ store that doesn’t have an automated cash register/checkout. 2013: There have been a few changes that were supposed to take effect 1 Jan 2013, the primary changes being no more of the pop up bars located on the sidewalk and bars closing a bit earlier, I don’t see many of these changes in effect. At what times can you buy beer and liquor in stores? What if I need to buy a beer at a store and it’s during prohibition hours? Try a local store (meaning not a large grocery store or 7-11) that doesn’t use a computer. If you’re cool about buying, they’re cool about selling it (they’ll put it in a bag). Trust me, I’m cool, at least in this regard. Can you drink in a bar or restaurant during hours when alcohol isn’t served in stores? Can you walk around drinking a beer? When do bars and clubs stop serving alcohol? It varies from bar to bar, but most bars close at 2am with some staying open later on Friday and Saturday. Many clubs serve until 4am and even later. Where can I find a drink at 4am? Many of the ‘pop up’ sidewalk bars will continue serving until you stop buying, buying meaning you stop buying for yourself and stop buying the bartender drinks. Pop up bars are the bars setup on the side of the street and sidewalks, or sometimes in a mini-van, they usually setup around 9-10pm and stay open late. In grocery stores and convenience stores, a Singha is thb36 for a can and thb42 for a bottle, many bars have a happy hour where beer is thb85, other than happy hour, beers will be from thb100-150, mixed drinks are anywhere from thb180-400, depending on what you fancy and environment you fancy drinking in. On election days (when voting is taking place), it’s dry with convenience stores and grocery stores not selling- try a local store. Some bars will serve on election days, some won’t, western owned hotels will serve. Religious holidays can be very, very dry. If it’s your desire, you can find a drink at just about anytime. My one request to foreigners- don’t embarrass me, with me meaning foreigners. For my sake, much less your own as a guest in a foreign country, drink, be drunk and have fun and go back to your dwelling while you’re still fun. If you need help finding your booze, email me and buy me a drink. 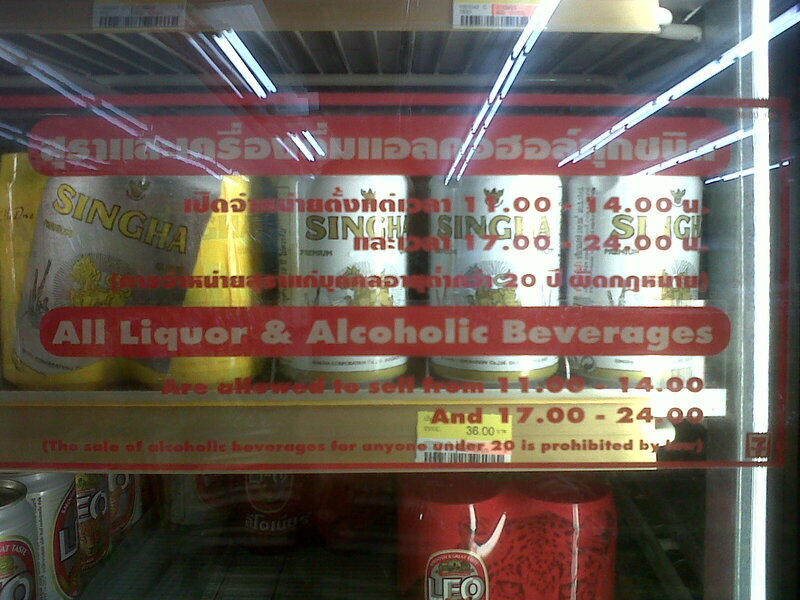 This entry was posted in Bangkok, Food & Restaurants, Thailand and tagged alcohol, booze, drinking in bangkok, Thailand. Bookmark the permalink. Where can I buy alcohol today? I have friends visiting from Canada and would like to have dinner and drinks but can’t find anywhere that is serving. We’re going to Soi 11, any tips? Can I bring my own wine to dinner? I’m desperate. It’s their last night and I promised I would take them out and now feel awful for forgetting the holiday. Any help is appreciated! I wish there was more variety in the beer here. Chang, Chang, Chang, Chang, Chang. Unless you’re slightly richer in which case it’s Singha, Singha, Singha, Singha, Singha. Why? That site is just horrible. It isn’t finished. There are no products for sale. Heck, you can’t even copy and paste from the website making emailing them more problematic than it should be!! The afternoon ban on alcohol sales is one of the silliest things ever. Given that you can pop into any “mom and pop” shop in any neighborhood in the country and buy a beer anytime they are open, this rule is complete nonsense that does absolutely nothing except for forcing us to pay higher prices that required for the same bottle of beer! Thanks for posting this information about the stupidest law ever conceived, especially in a country that’s always hotter than hell and hungry (should I say thirsty?) for tourist spending, yet continually finds new ways to antagonize said cash cows, err, I mean honored guests. One quick correction- you CANNOT actually drink during the restriction period in most restaurants, only those that have paid the bribes to the cops, err, I mean that have been given special exemptions. If you are drinking your way down Sukhumvit you won’t have a problem, but I was surprised that even a bit off the main street down So 11 I couldn’t have a cold beer to go with my cheeseburger at 3:30 PM! And, if you have the grave misfortune to be out in the real Bangkok, some Godforsaken place like Big C Latphrao, you will be denied! are you really so daft as to not be able to fathom why the law would have been written that way? or are you just too lazy?